The lodge hunts are a favorite among some of our repeat clients, and these hunts may take place in either spring or fall. The spring hunts feature long, sunny days for the most part. Your day starts with a hearty breakfast in the main lodge, followed by a snowmachine ride up above treeline, where the day is spent glassing for bears that have just emerged from their dens. The fall hunts involve spike-camping above treeline, and hiking the river bottom or hillsides in search of bears feeding in blueberry patches. 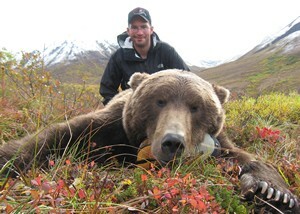 The Alaska brown bear is, to many people, the world’s foremost trophy when it comes to North American dangerous game. The largest predatory mammal on the North American continent, our bears can tip the scales at over 1,200 pounds and stand nine feet tall. 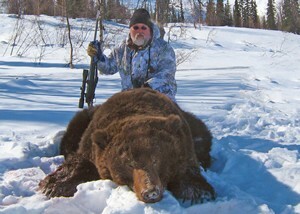 Though the Alaska Hunting Regulations consider brown bears and grizzlies to be the same animal, most hunters do not. We are fortunate to have both kinds in our hunting areas. The smaller grizzlies, averaging about six feet square, can be taken in combination with our hunts for mountain game such as sheep and caribou, for a nominal trophy fee. 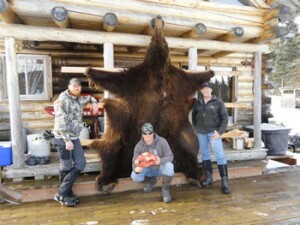 We also offer hunts specifically targeting grizzly. Brown bear populations are stable in our areas, and have provided consistently good hunting for many years; you have the equally good options of a lodge-based hunt or a float hunt down a remote river. The float hunts put you on a salmon stream, where every night you will camp among fresh bear tracks and stalk the pools and shallows, or the mountainsides for feeding bears. Hunters opting for time slots later in the season will need to be in good physical condition, in order to climb the mountains for bears feeding in hillside berry patches. Black bears are abundant across all of our hunting areas, and we strongly suggest our fall hunters consider purchasing a black bear tag, regardless of which hunt you choose. Our bears sport beautiful coats and average between six and six-and-a-half feet in size. 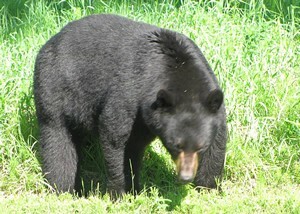 Black bears are frequently taken out of sheep camp and out of the lodge, where they are most often found feeding in hillside blueberry and huckleberry patches.